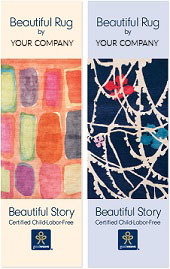 Displaying the Beautiful Rug Beautiful Story brochure in your showroom is a great way to start a conversation about GoodWeave and your commitment to ending child labor. With the 4.75” x 7” decal affixed to your front window or door, your competitive advantage begins even before the client walks in the door. This guide, “Purchasing Your One in a Million Rug,” provides helpful rug purchasing tips for clients and shows your commitment to ethical labor practices. Including a Certificate of Origin with every purchase connects your clients with the people who made your rugs and communicates that your company is committed to the highest standards of integrity. A 6” x 6” or 9” x 10” “Proud Partner Placard” is a great way to tout your GoodWeave affiliation at trade shows, special events or in your showroom. GoodWeave greeting cards are a beautiful way to remind your clients during the holiday season of your GoodWeave partnership and your commitment to ending child labor. These versatile cards can also be used as customer follow-up or a thank you after a purchase. GoodWeave can provide a wide selection of videos for events, tradeshows, or even showroom viewing. Order a co-branded banner to show your GoodWeave affiliation at trade shows, special events or in your showroom. Contact Partnership@GoodWeave.org to request marketing materials for your showroom or event.